"The author was the UN's first Director and Deputy Head of the UN Peacebuilding Support Office (PBSO) in New York. This makes him the "prime insider witness" of how UN peacebuilding has evolved; and, in particular how the UN Peacebuilding Commission came into being; how it developed; and what limitations it was and is still facing. In this book, Otobo shares with us his analyses while working for the UN but also his thoughts, gained from a greater distance once he left the UN. Otobo's book is about the real world of peacebuilding in the UN - and this should give it a distinct place among the many mostly academic studies on this subject. It should make it also "a must-reading" for everyone who reflects not only on consolidating peace in Africa but also on the UN's role in general in maintaining peace and security for future generations." "An enlightening, lucid and powerful narrative, which provides an authoritative and in-depth account of United Nations peacebuilding efforts in Africa. This enriching book will prove invaluable to policy makers and scholars interested in United Nations work in peace building, and, in particular the role of the UN Peacebuilding Commission, in supporting post-conflict and fragile states in Africa. 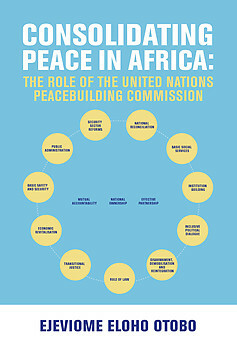 The book not only portrays the UN Peacebuilding Commission's critical work in consolidating peace and preventing relapse into violence in countries emerging from conflicts in Africa but equally offers rich insights into the challenges confronting the Peacebuilding Commission in performing the tasks entrusted to it." "This book is one of the earliest and most detailed studies of the United Nations (UN) Peacebuilding Commission from a consummate insider who had a front--row seat to many of the events described, while serving as its deputy head of the UN Peacebuilding Support Office from 2006-2013. His rich insights will be useful for both academics and policymakers with an interest in this nasecnt but vital area in the UN's evolving security architecture." "This book provides essential and in-depth "insider perspectives" on the evolution, inner workings and impact of one of the most important institutional innovations of the 2005 UN World Summit. Scholars, policy-makers and peacebuilding experts will greatly benefit from this thoughtful and detailed collection of essays on the United Nations Peacebuilding Commission - authored by one of the most knowledgeable experts on the subject." Ejeviome Eloho Otobo, formerly Director and Deputy Head of the Peacebuilding Support Office at the United Nations Headquarters in New York, is currently Non-Resident Senior Expert for Peacebuilding and Global Economic Policy at the Global Governance Institute, Brussels.